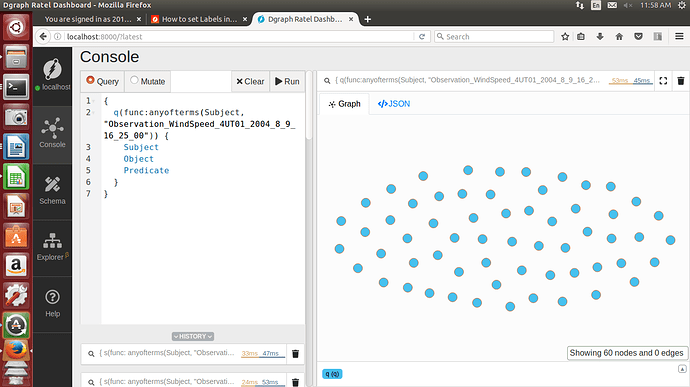 I have loaded JSON data in ratel and then I have run a query which only displays nodes. So, how to set label to each node? So, how to set label to each node? That depends on what kind of label you’re talking about. "uid": "0xd", #UID of the existing node. 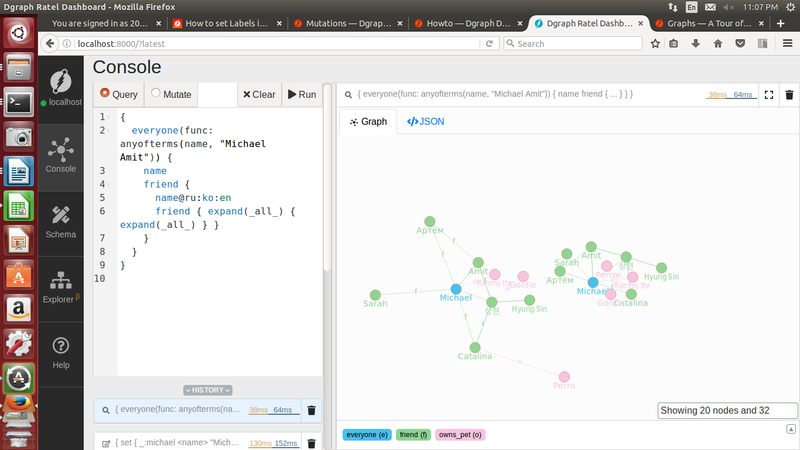 As we can see here there is no label; here I want to label each node by its subject name. Also I want to create edges between subject and object…will it be possible? Wait, is this a JSON representation of a RDF? This format is invalid for Dgraph. Works, but invalid. This is because the format is wrong. Check the right format in docs. I have converted my .csv file by using csv2json command as per given in docs. 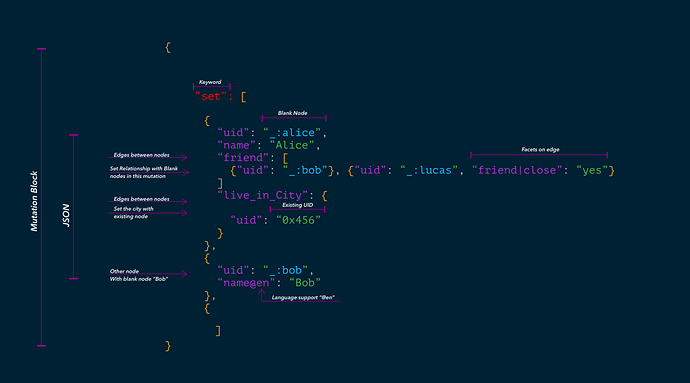 I did this image to explaing a bit the JSON format. hummm, I have to check this. Seems wrong. Nope, the Docs are right. But I have followed the steps given in docs. 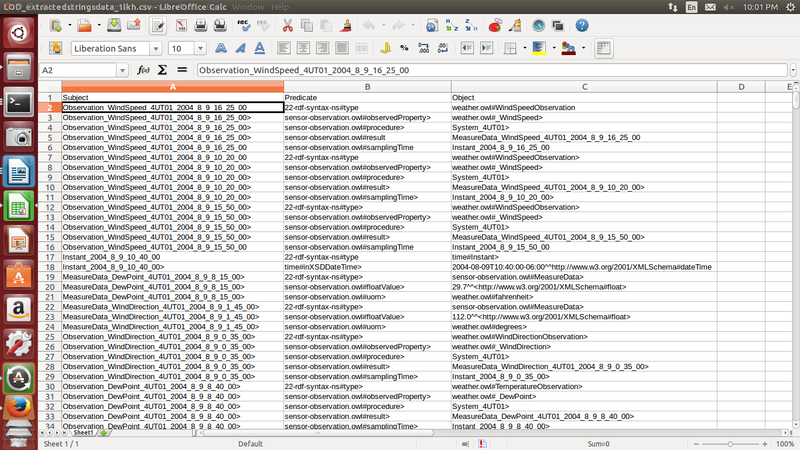 This is how my csv looks like. 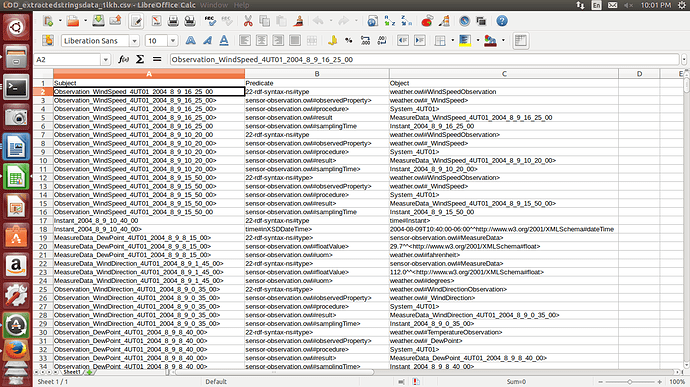 Okay, your CSV is a JSON representation of RDF format. You need to convert this. Or export to RDF. It’s already in RDF tho. But in a CSV file. Can you suggest me how? I didn’t find any such tool for direct conversion. 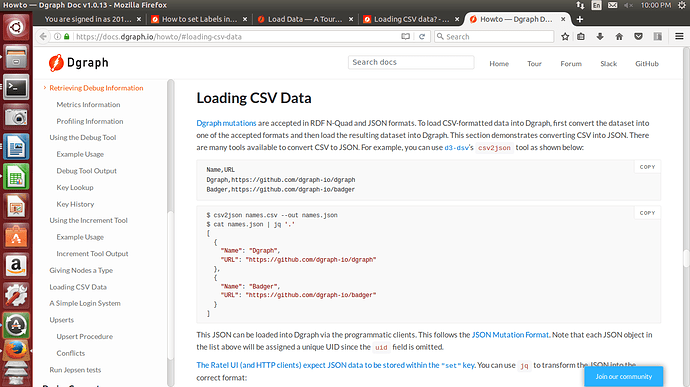 And after converting it to RDF …again I have to convert it to JSON right? you’re good to go. So you just need to add a “.” dot in every Nquads lines and use it in a mutation. Don’t need. Use the RDF. No., I don’t have all strings like this. And I have 98k triples. So, to set it like that is a crucial task I guess. No., I don’t have all strings like this. Didn’t get it. You can. And I have 98k triples. So, to set it like that is a crucial task I guess. I think you didn’t undestood what I said. Then by which extension should I save it?.. I mean will it be .rdf file? Then label will create automatically…right? Sorry, I still do not understand which Label you’re talking about. The “kind” or the naming representation in Ratel UI? Here each node and edge contains a label for ex. 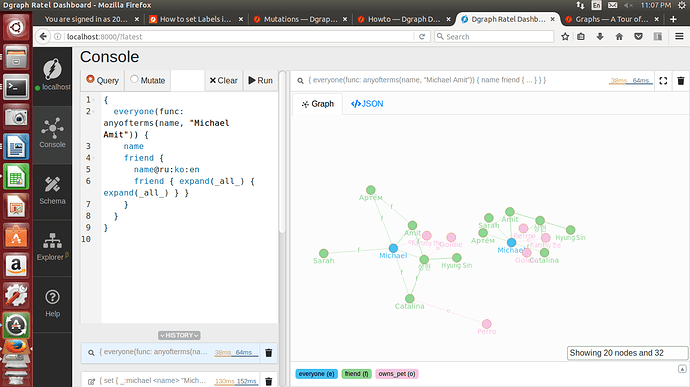 nodes have names like Michael, Amit etc. [with green and blue font …just below the nodes],edge is containing f on it. So I want that type of label on my nodes I mean by using my dataset. Ah, okay. This is “the naming representation in Ratel UI”. So this takes in consideration the predicate itself. I’m not sure what pattern it chooses to predict Ratel “labeling”, but it will certainly recognize one. If not, try using Alias.